Yoga has been a part of Raquel’s life since 1999, when she began practicing Hatha at a small studio in San Diego, California. After receiving her 200hour Vinyasa Yoga Teaching Certification from La Jolla Yoga Center, San Diego, in 2010 she began teaching immediately. She continued her studies in a 100hour Anusara Yoga Immersion at Yoga Tree San Francisco. Upon arriving in New York Raquel began working ;& studying at Yoga People in Brooklyn Heights where she met many of wonderful teachers and influences. Raquel is currently completing her Advanced Teaching Certification in Yoga Therapeutics at Abhaya Yoga, Dumbo Brooklyn with Tara Glazier. Before moving to New York Raquel spent two years teaching in the South of France to an international yoga community. She studied yoga, practiced and taught at Sohum Yoga Shala Antibes, France. She recently returned to the United States and resides in Brooklyn, New York. Raquel draws from the Vinyasa, Ashtanga and Hatha Yoga traditions. 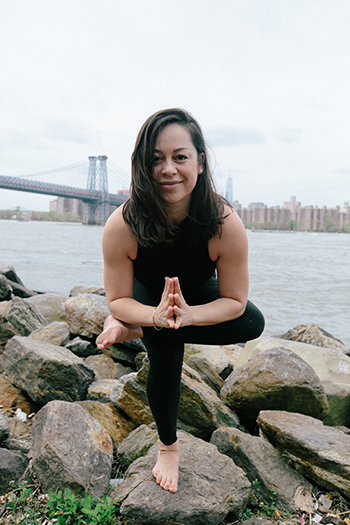 She combines energetic movement and breath in mindfully aligned postures to create full mind-body connection on the mat. She also incorporates chakra aligned yoga, meditation, pranayama, flow sequences and deep stretching. In her class you will find yoga with traditional roots, an instructor with fun lighthearted vibes and a safe environment to practice in.